At its 35th session, the Committee noted with serious concern that a single Liquefied Natural Gas (LNG) plant on Curtis Island had been consented. The mission noted that the plant had been assessed as impacting on attributes of the Outstanding Universal Value of the property. It transpires this is one of three such plants on Curtis Island, with a major associated dredging programme underway, and a fourth application still to be determined. The information provided by the State Party and the findings of the mission, shows a rapid and recent increase in proposals for coastal development with potential impacts on the OUV of the property. The information illustrates that, to date, about 70% (41 out of 61) of all such proposals determined over the past decade (1999-2011) have been approved, presumably with a range of attached conditions. More than 60% of all such development proposals (67 of 108 proposals in total) were made in the last 5 years, with a substantial and consistent increase since 2008 notably in relation to projects associated with the export of coal and Liquefied Natural Gas. Proposals for development located both within and outside the property currently under consideration (circa 45 in total, of which circa 35 applications are seeking determination before the end of 2013) include LNG and other processing facilities and associated infrastructure, port facilities and dredging, tourism developments, aquaculture and agricultural developments, mining and extractive industries, transport infrastructure (excluding port facilities), pipelines, water treatment facilities and water supply infrastructure, and residential developments. Considering the high rate of approvals over the past 12 years, this unprecedented scale of development affecting or potentially affecting the property poses serious concerns over its long-term conservation. The mission further noted that, whilst many aspects of the management of the property set standards, there is a range of unaddressed concerns regarding the protection and management of the port and LNG facilities in Gladstone Harbour and on Curtis Island and the protection of its surrounding environment. Concerns raised by stakeholders include reduced water quality from dredging, inadequate independent, scientific oversight in monitoring water quality, suggested lack of government response when water quality targets are exceeded, impact on traditional use, and lack of satisfaction regarding procedures for public consultation and transparency. It does not appear that offsets that were part of the conditions for consenting developments in Gladstone Harbour and on Curtis Island are appropriate and sufficient mitigation of the impact the facilities have on the property. The mission considers that these concerns should be addressed prior to any port development and ensure that port facilities and operations throughout the property meet the highest international standards of best practice, commensurate with the status of an iconic World Heritage property. Until the results of the Strategic Assessment noted below are achieved, and a related plan for sustainable development has been put in place, a highly precautionary approach is required in relation to all developments that might impact the OUV of the property, together with effective and regular reporting to the World Heritage Committee. Without such a precautionary approach the outcomes of the Strategic Assessment may be compromised, and there are a number of developments that, were they to proceed, would provide the basis to consider the inscription of the property on the List of World Heritage in Danger. At its 35th session, the World Heritage Committee urged the State Party to undertake a comprehensive strategic assessment of the entire property, in order to enable a long-term plan for sustainable development that will protect its OUV. The State Party has responded positively to this request and has begun the implementation of the Strategic Assessment via two concurrent exercises lead by the State of Queensland and the Great Barrier Reef Marine Park Authority. The mission was able to participate in a workshop on this assessment during its visit and its report makes a range of relevant observations on the conduct of the assessment. The mission noted that the Strategic Assessment should be completed in a coordinated and fully consultative process, against a number of defined criteria for success, and considering the conclusions and recommendations of the mission as set out in its report. The assessment should address fully the direct, indirect and cumulative impacts of developments on the reef and lead to concrete measures for ensuring ecological, social and economic objectives for the property are met in a balanced manner and with a net-benefit to the overall conservation of the OUV. The resulting long-term plan for the sustainable development of the property should be submitted to the World Heritage Centre for consideration by the World Heritage Committee at its 39th session in 2015. The State Party report provides an extensive description of the protection and management arrangements as they currently are in operation, which are complemented by the findings of the reactive monitoring mission. The property has a history of strong management practices of which many are of high quality and an example to other marine protected areas. However the mission noted that there are threats to the property, and that assessments indicate that despite management successes there has been a continuing decline in the quality of some parts of the property, notably inshore areas to the south of Cook town. The Great Barrier Reef Outlook Report in 2009 assessed the future prospects of the property as poor, requiring decisive protection and management actions in the coming years. The overall protection and management arrangements for the property should be subject to an independent review, including in relation to coastal and port development. Concerns to be addressed include the discrepancy between the boundaries of the Great Barrier Reef Marine Park and the slightly larger ones of the property. Furthermore, key coastal areas are excluded from the property but contain activities that pose threats to the conservation of the OUV of the property. There is a need for more effective coordination of protection and management between the Federal and State levels for the property as a whole, and areas outside its boundaries that may affect it. Additional issues of concern include complex and potentially overlapping legislation and the adequacy of funding for the property, where despite high capacity the growing needs are outstripping current budgets. A central issue is that there does not appear to be consistent or specific recognition of OUV in plans and decision taking processes, and there is concern regarding the protection of a range of aspects that make up the OUV of the property, as these are not all being consistently considered. A retrospective Statement of OUV has been submitted for the Committee’s approval, and should provide the basis for rectifying this. The Great Barrier Reef Outlook Report should, in future, also include a specific assessment of OUV. Poor water quality poses a major threat to the conservation of the property, and is the principal driver of the decline in the inshore areas of much of the property. Through concerted management action the negative trend in water quality has recently been reduced and shows positive signs of restoration. The Reef Water Quality Protection Plan (Reef Plan) is a collaborative programme of coordinated projects and partnerships designed to improve the quality of water in the property through improved land management in reef catchments, and is implemented jointly between the Federal and State Governments. The programme aims at halting and reversing the decline in water quality entering the reef by 2013, and to ensure that by 2020 the quality of water entering the reef from adjacent catchments has no detrimental impact on the health and resilience of the property. Preliminary results indicate progress towards these targets. According to information from the Queensland Government, nitrogen run-off from regulated farms has reduced by approximately 14% since 2010. It is noted, however, that it will take decades to see the full benefits of the investment. The continuation of the Reef Plan initiative and its associated regulatory and incentives packages is essential to reach the targets set for 2020 and the overall long-term conservation of the Great Barrier Reef. Funding for these programmes is currently available until 2013 and will need to be maintained beyond that date. Climate change is a key threat to the property and building resilience, through the reduction of other pressures, is a means to maximize the capacity of the ecosystem to adapt to its impacts. The World Heritage Committee, at its 35th session (UNESCO, 2011), welcomed the State Party’s commitment to improve the property’s resilience and its ability to adapt to climate change. The mission considers that defining clear and potentially statutory targets for the future condition sought for the OUV of the Great Barrier Reef could be beneficial to the overall improvement of resilience for the property. Such targets could provide a new and positive paradigm for considering the long term future of the property, and should be supported by sound and objective scientific analysis regarding the various activities that contribute to the vulnerability of the reef and therefore limit its capacity to adapt to the impact of climate change. The World Heritage Centre and IUCN note the conclusions contained in the mission report. 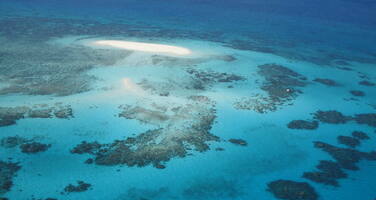 Since the listing of the Great Barrier Reef as World Heritage, the property has tackled a series of threats effectively. However the OUV of the property is threatened and decisive action is required to secure its long-term conservation. The rapid increase of coastal developments, including ports infrastructure is of significant concern. The property further lacks an overall plan for the future sustainable development of the reef that will lead to protection of OUV in the long-term. The World Heritage Centre and IUCN stress that it is essential that the State Party applies a highly precautionary approach to consenting new coastal and port development that might affect the property. Such an approach implies that the State Party should not permit any new port development or associated infrastructure outside of the existing and long-established major port areas within and adjoining the property, and also to ensure that development within major port areas is not permitted if it would impact individually or cumulatively on Outstanding Universal Value. They recommend that the Committee remind the State Party that it is essential that no port, coastal or other development that could affect the property should be approved if it would pre-empt a positive outcome of the Strategic Assessment and the resulting plan for the sustainable development of the reef, which would be considered by the World Heritage Committee at its 39th session in 2015. The mission further concludes that the concerns over the management arrangements for the facilities in Gladstone Harbour and on Curtis Island should be addressed through an independent review and result in the optimization of their operation, consistent with the highest internationally recognized standards of best practice. Such review should take place prior to the consent of new major port operations. Finally, considering the overarching importance of water quality to the reef’s health, it is indispensable that the current level of investment is sustained beyond 2013 to ensure recent positive trends are sustained. It is further essential to reduce development and other pressures as much as possible to enable an increase in the reefs resilience to adapt to climate change. The property does not currently meet the requirements for inscription on the List of World Heritage in Danger. However should some of the most threatening developments proceed further towards consent, it is recommended that the World Heritage Committee considers the possibility of listing the property as being in danger. The consent of such developments would directly risk irreversible impacts on the OUV of the property, and pre-empt an effective outcome of the Strategic Assessment and its envisioned plan for the long-term sustainable development of the reef. It is further recommended that the State Party undertakes regular evaluation of the OUV via its existing 5 yearly Great Barrier Reef Outlook Report cycle. It is recommended the second report, due in 2014, is presented to the World Heritage Committee when it becomes available, and includes an assessment of the long term prospects for the OUV of the property, threats to OUV, and the effectiveness of protection and management measures to address such threats. They recommend the Committee should also seek further information from the State Party regarding its progress at its 37th and 39th sessions, to confirm that the necessary actions to address the threats to the OUV have been taken. 11. Decides to also consider a further report from the State Party on the state of conservation of the property, the findings of the second Great Barrier Reef Outlook Report, and the anticipated outcomes of the completed Strategic Environmental Assessment and related long term plan for sustainable development at is 39th session in 2015.